Emma is the unique creation of Chef Liz and Captain Rene Jacquot, offering three different cruise routes: the traditional “Midi”; cruise the canal summit; or make your way through the salt flats at the headwaters of the Mediterranean. Originally from Ireland, Liz has dedicated herself to contemporary French cooking and might very well be the best Chef on the Canal du Midi. She relies on regionally-sourced ingredients for the freshest of flavors, and creates her approachable menus based on seasonal produce and handcrafted products. Hailing from the nearby seaport town of Sete, also known as the “Little Venice”, Captain Rene was born into the boating industry, and is an engineer by trade. Styled as a “floating country cottage”, Emma’s warm décor is that of a comfortable inn, with plenty of seating on the vessel’s expansive deck. Cozy cabins are decorated in fresh pops of color, with cheerfully patterned bedding and local artwork. Leisurely strolls or brisk bicycle rides along the tree-lined canal towpath reveal the region’s flora and fauna. The inviting ambiance aboard Emma encourages guests to relax and unwind, all the while being pampered by the attentive crew. Visit Liz in her kitchen for an informal cooking lesson or stop by the wheelhouse as Captain Rene maneuvers Emma through the twists and turns of the canal. Elaborate table settings, creative plating, and wine pairings featuring the vintages of the Languedoc are sure to please even the most exacting of epicureans. Excursions are fun and festive with flexibility to accommodate to personal interests. Foodies and Francophiles can enjoy shopping with Chef Liz at lively local markets, while special visits to formal gardens or nature preserves can easily be arranged. Want to explore ashore all day? Chef Liz can pack you the perfect French picnic! Only on the Emma are you welcomed like royalty and treated like family. In the afternoon, you will be met by a crew member of the Emma at the designated meeting point. From here, relax as you are chauffeured to the barge, moored in lovely town of Trebes. A traditional champagne welcome and introduction to the crew awaits you, before your first of many gourmet dinners onboard. This morning, your Tour Guide chauffeurs you to Carcassonne, a fortified Medieval fortress with a walled city. Explore the ancient castle and preserved ramparts to admire the mighty 53 Roman towers. Stroll the cobblestone boulevards into local cafes and specialty boutiques. Back onboard, this afternoon's cruise is the perfect time to laze on deck, or explore the tree-shaded towpath on bicycle or on foot. Or, visit Captain Rene in his wheelhouse and help him steer the barge. Cocktails and canapes precede another gourmet dinner. This morning's sightseeing is your pleasure! 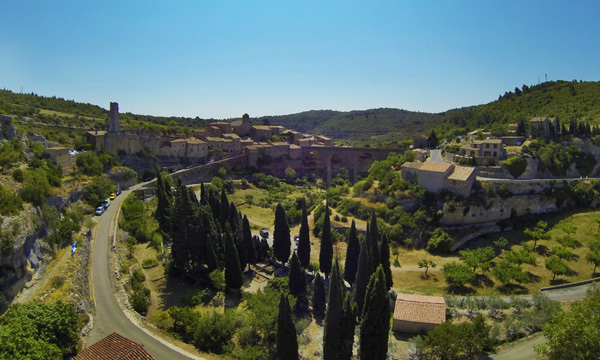 A visit to Lagrasse reveals a village in the heart of the Corbieres where charming avenues house a multitude of specialty boutiques and craft shops. Or, discover the natural wonder of the giant underground cave at Cabrespine. Exploring the ruins of an old Cathar chateau is also on offer. After one of these excursions, your Tour Guide returns you to the Emma for an afternoon cruise. Laze on deck, or traverse the towpath by bicycle or on foot. Enjoy cocktails and dinner onboard. A visit to a lively local market in Olonzac begins the day. Shop alongside the locals for seasonal fruits, colorful vegetables, artisan breads, and spice blends. Choose your own fare for lunch onboard today! Then a short drive to the hills reveals Minerve, a preserved Medieval city with fascinating social, historical, and military import. Your Tour Guide returns you to the Emma for an afternoon cruise. Relax on deck, or explore the towpath with a gentle pedal or leisurely stroll. Upon mooring, cocktails are prepared and a gourmet dinner awaits. The morning begins with a visit to Narbonne, a regional capital established in 118 B.C.E. as a Roman colony. A study of European history and local modernity thriving side by side, Roman ruins are reverentially presented in public spaces, while the lively Narbonne market reflects the region’s gastronomic bounty. Your Tour Guide returns you to the Emma for a lazy afternoon cruise. Unwind on deck and watch the scenery slip by. Meanwhile, Chef Liz is crafting tonight's dinner using ingredients from this morning's market visit. 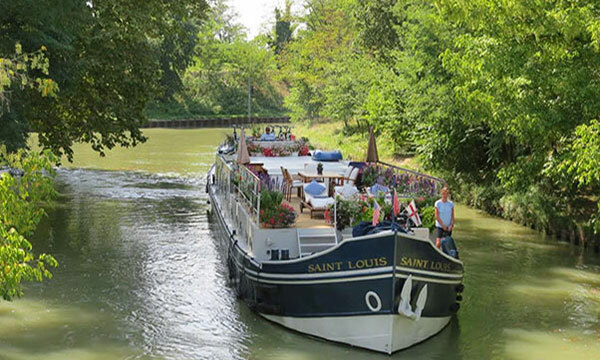 Today we continue our lazy cruise which takes us under the smallest bridge in France, if you can get under this, you can go anywhere on the canal system! A choice of visits awaits you. A winetasting at Guery or at St. Chinian; a visit to the Abbey at Fontfroid; a trip up to the prehistoric site of Oppidum d'Enserune with its panoramic views; there is so much to see, you will be spoiled for choices! End the cruise in style at the Captain's Dinner, followed by an informal concert under the stars. 20% discount on private charter bookings for the following 2019 cruise weeks: April 6-12, 13-19, 20-26, April 27 – May 3, May 4-10, May 11-17, June 1-7, 8-14, 15-21, 22-28, June 29-July 5 and July 6-12. Valid for new 2019 bookings only.